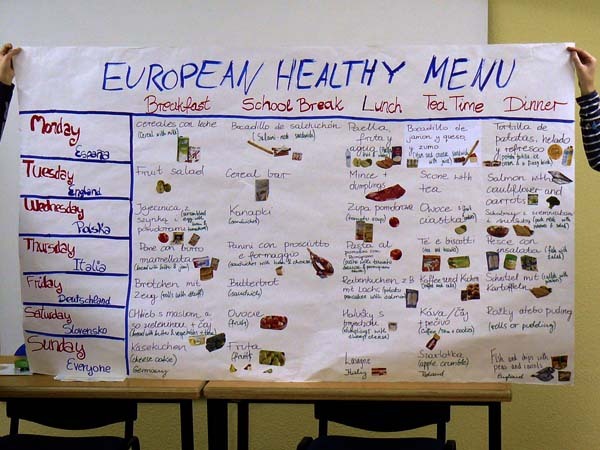 At the project meeting in Ibi (Spain) in November 2009, the students attending the workshop were asked to devise a healthy European menu. This was done in three different multinational groups with different outcomes. It turned out that "healthy" is not a clearly defined term, that different countries of origin led to different suggestions, and that some of the students preferred sweet stuff that they liked but that is not necessarily good for your health. In the following we document the results of one of the groups at the workshop to show the contradictions that appear when you try to plan a healthy menu. one piece of fruit: orange, apple, pear ... Also, we can have milk with cereals and one slice of toast with tomato, oil, or jam. a sandwich with bacon or a tortilla of potatoes. gazpacho, it's a food with bread, meat, and spices. For dessert you can eat fruit. a sandwich of highland ham or cheese, and you can drink orange juice. a salad with some meat or fish. milk, orange juice, fruit and toast with jam and butter. a sandwich with ham or tomato. bread with tomato or chocolate; ice cream and sweets. muesli with fruit or a bread with marmelade. a sandwich with lettuce and cheese. potatos with eggs and spinach. coffee or tea, milk with corn flakes and sandwiches. chicken soup, pork chop with cabbage and potatoes. toast with butter and jam. pasta with tomato sauce and chicken and vegetables. coffee, fruit, sandwiches, milk with chocolate. We're going to a Chinese restaurant. sweets – bar of chocolate. donuts with milk and water.